Happy Sunday and it's time for a new challenge at 613 Avenue Create. Rick St. Dennis is our sponsor this week and the winner will receive 3 digital stamps from Rick's collection. So get out all those peace signs, sentiments or papers you've saved up and show us what you've got. Thanks for stopping by and stayed tune for round two today. Nancy, This is so adorable!! Reminds me of my high school days with long straight hair and bell bottoms! 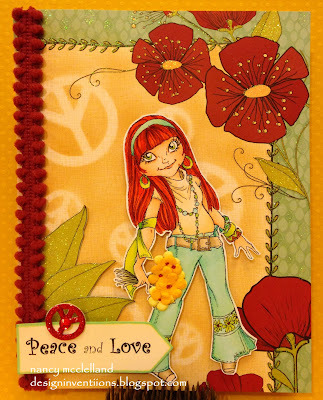 Fabulous peace card, I love your flower child image. Thank you for sharing your work with all of us at Crafty Boots Challenges. Fabulous image and I love the background - the red poppy flowers are amazing. Thanks for joining in at Crafty Boots Challenges this time.